We are fortunate to have Mr. Shishir Athale enlighten us on all these questions on June 5th, 11am at the NCL Venture Center (June 5th is also the Environment Day, a fitting coincidence!). Shishir is one of those very few intrepid entrepreneurs, who have the guts to get into this very tough market, where he has been painstaking building his company called Sudnya Industrial Services. Sudnya is an ESCO (Energy Services Company) which identifies energy efficiency improvement opportunities for clients, often putting their own money on the line, getting paid only if those savings materialize (now you know why this business is not for the faint-hearted!) Besides guts, this business also needs a rare mix of capabilities: engineering, project planning, management, finance, marketing all rolled into one. It will be exhilarating walking Shishir’s journey (while safely holding his hand 🙂 on this tough trail. Before Sudnya, Shishir spent many years at Thermax and other companies, getting trained on many engineering skills in heat and co-generation fields that ultimately culminated into Sudnya. Before Thermax, he managed plants for CPG companies where he often implemented energy saving projects, sometimes achieving 25% energy savings. Shishir is well recognized as a trainer for energy managers by none other than FICCI. He was on CII’s sub-committees on Cogeneration and Energy End-use Efficiency and on an MNES Committee for evolving a National Policy on Bio-mass Based Cogeneration. He is a qualified Lead Assessor for ISO 9000 certification and has undergone training in India and abroad. He qualified as a Certified Energy Auditor in the first examination conducted by the BEE in 2004. Shishir is a graduate in Chemical Technology and now resides in Pune. As always, seating is limited, no reservations and strictly on a first-come, first-seated basis. 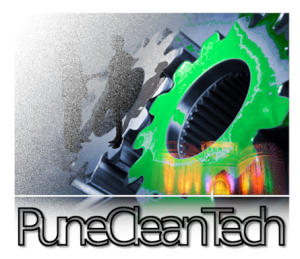 PuneCleanTech is a special interest group of PuneTech focusing on Clean Technologies. It is an awareness, education, and networking platform to showcase Clean Technologies developed and used in and around Pune, one of the largest Industrial hubs in India. The network brings together technology professionals, entrepreneurs, students, policy makers, investors, and citizens interested in Energy Efficiency, Renewable Energy, Waste management, Water Management, and Environmentally-Friendly Design/Development/Delivery Alternatives to Traditional Products and Services. Those interested in this area are urged to join the PuneCleanTech mailing list, Anil Paranjape (amparanjape@gmail.com) with support from PuneTech and NCL Venture Center. Venture Center – a CSIR initiative – is a not-for-profit company hosted by the National Chemical Laboratory, Pune. Venture Center strives to nucleate and nurture technology and knowledge-based enterprises by leveraging the scientific and engineering competencies of the institutions in the Pune region in India. The Venture Center is a technology business incubator specializing in technology enterprises offering products and services exploiting scientific expertise in the areas of materials, chemicals and biological sciences & engineering. Can you please help me locate it. Neerav, Sorry about the bad link. I’ve updated the article to point to the correct link.